Confusing title? 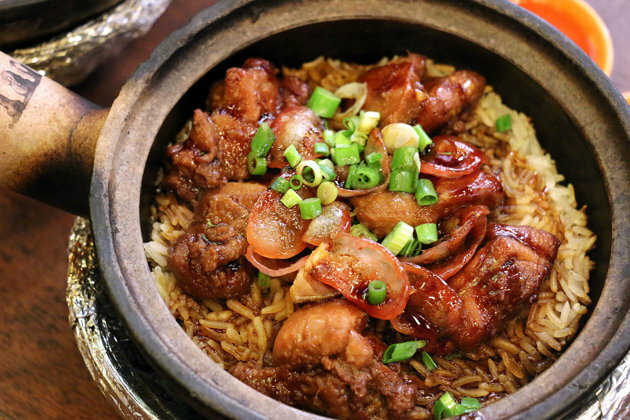 Originally, claypot chicken rice is cooked using a claypot. But since I do not own one and it does not seem useful if I do own one because I do not have a gas stove at home. So in order to make this dish, I use my rice cooker. What’s missing is just the lovely, crunchy rice crust at the bottom but with some tricks, I am able to pull it off. This dish is popular in food courts. Growing up, I remember my sister eating this most of the time while I had fried noodles. 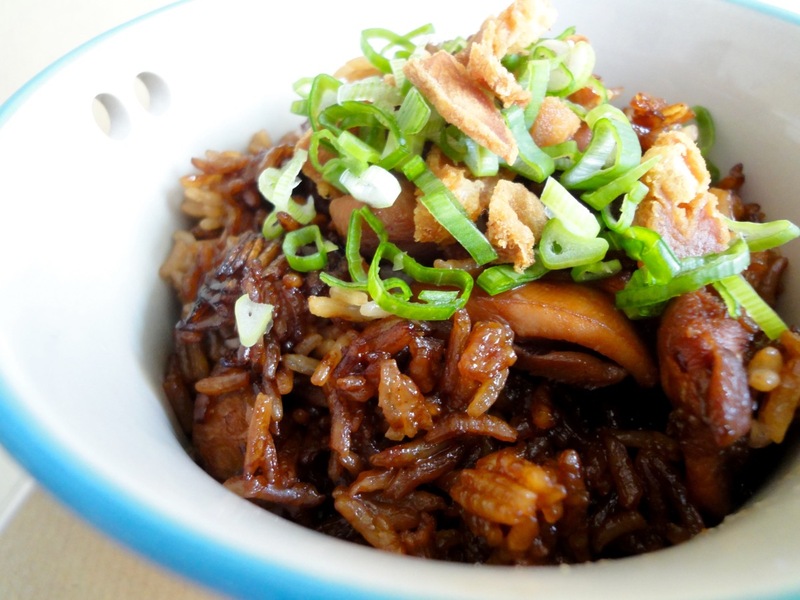 I have been cooking this at home for a few years now, and the last time I was back in Malaysia, the hubby and I had the real claypot chicken rice at a food court. Sadly, I’ve gotten to accustom to the one I make at home and the food court’s one did not taste nice. Even the hubby said mine was better (probably buttering me up, so I still cook for him). It also could be because I add a massive amount of dark soy sauce and sesame oil that it really makes the dish tastier and the colour is fabulous. The colour part is mostly because of my mother, because she loves her food to be really dark/black (especially when it comes to soy sauce being the main ingredient). For example if she orders KL Hokkien Mee, she wants it reaaaaaalllyyyy black. If not, she looses her appetite. 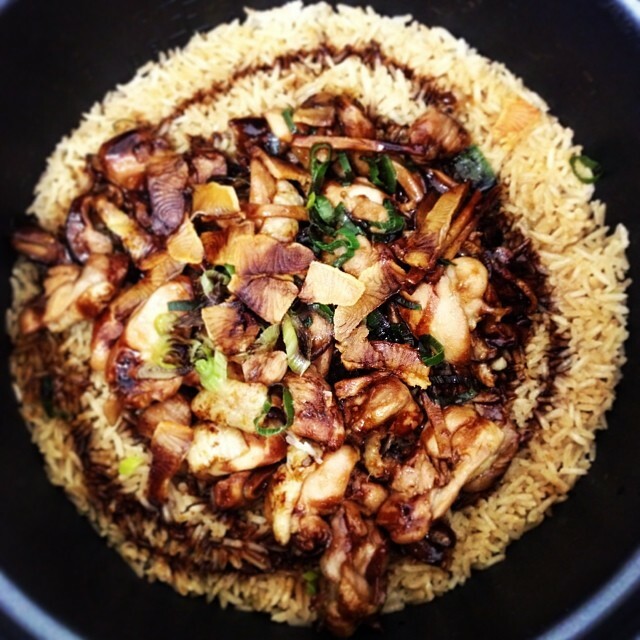 So when it came to me cooking claypot chicken rice, I got put off when it first turned out very pale…so I added more dark soy sauce after it was cooked and it turned out perfect. This was the first claypot chicken rice I cooked, see how pale it is! Recipe adapted from Rasa Malaysia . Wash salted fish and pat dry. Heat up a pan to medium heat with some oil. 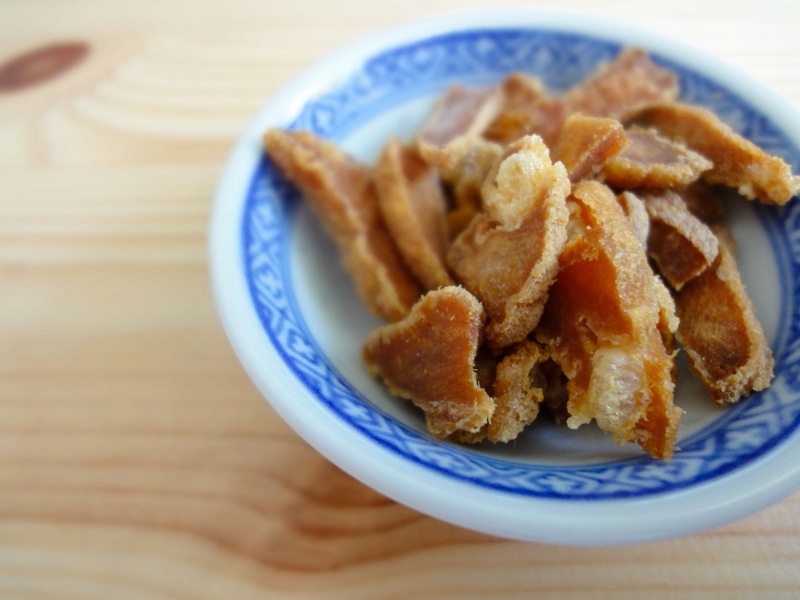 Fry salted fish till crispy. Clean chicken and marinade for at least 30 minutes before cooking. Once marinated, heat up a pan with some oil. Medium high heat. Add chicken and the marinade. Stir fry till 3/4 cooked. You can also fully cook it, but make sure you still have gravy left. Add chicken and gravy into half cooked rice. Add rice, water and all ingredients under rice into rice pot. Mix well and press cook to start cooking the rice. Add cooked chicken and gravy into half cooked rice. Allow to cook until the rice cooker button pops to stay warm. Add extra dark soy sauce and sesame oil. Let the rice cooker be on stay warm for 15 minutes before serving. To serve : top with fried salted fish and spring onions. Add sugar to marinade as well. Also if you would like to have that crust, i prefer cooking everything in one pot using the stove. Firstly, cook the chicken in the pot until desired condition. Add in raw rice, and stir fry until half cook, or until the rice is translucent. Add in desired water for rice. Bring to boil, simmer on low heat, covered for 15 mins. Fluff rice and ready to eat. Thanks for your comment. Yes, you can add sugar as well. But I personally do not add it because I use dark soy sauce which is sweet. Thanks for posting the recipe. Is the cup for the rice and water the rice cooker cup or normal measuring cup?